As a modeller and someone who has some interest in the fighter pilots of the German Luftwaffe of WWII, a historical figure such as Gerhard Barkhorn I would have thought is well known. But when you talk about him with others such as Eric “Bubi” Hartmann, Gunther Rall, Adolf Galland, Hans-Ulrich Rudel. These pilots are indeed much better known to the non-Luftwaffe obsessed bunch that many modellers are. It is nice then to see such a well-respected publishing house such as Luftfahrtverlag-Start take on a book about this ace. Not that this book is written by Axel Urbanke – it is written by Bernd Barbas, who is a recognized Luftwaffe author and historian. I am sure the Urbanke’s would have fallen off their chairs almost when someone gets in touch with them and asks can they do all the work, interviews and gather photos for them. I am sure they had input and I have seen photos of Axle at the printing shop with this book – but it would have been an offer they could not refuse to have Bernd do all this work on the tittle. Bernd had become friends with Barkhorn through personal meetings and conversations as well as the opportunity after he and his wife’s accidental death to secure a lot of the material through his comrades who shared service with him on the ground and in the air. The usual classy additions that the Urbanke's add are all there to see - i know how hard they worked on some parts of this book so you would think that the customer gets the best of both worlds here. Physically the book is a large and heavy book in hardcover, landscape format measuring 25 x 28 cm or 9.25" X 11" inches with a lovely green and gold bonding. The dust sleeve features a photo of the ace in one of his more famous mounts in full colour on the front. The text is written in German language and in English. The story and caption text runs side by side and the pictures that illustrate the story are usually quite relevant to what is going on that page. There are no silly footnotes to scroll backward and forward and the thing that I like about this book on opening up the padded packing case is that it was not an impenetrable tome like a lot of these other books can be. The story focusses on one man and the story pretty much sticks to the facts. It is tightly written and although you can tell that Bernd want to just let the story unfold without interjecting with too many personal thoughts. The book IS big but it never bored me or felt like too much of a chore to get through it. The maps in this book tell a lot of the story. Several times Barkhorn’s unit moved from field to field – and there are very good maps that show you just what day and when they did move. There is a map showing training flights early on in Barkhorn’s career that shows just where he flew. These you could say are not necessary but they really do illustrate the fast paced movement of these fliers and the distances they travelled in war. There are eight colour illustrated maps in this book, and although though some of the text in English is missing on some of them most people reading this book could well work out what is going on. The other illustrations are from my very favourite illustrator of profiles Mr. Claes Sundin. 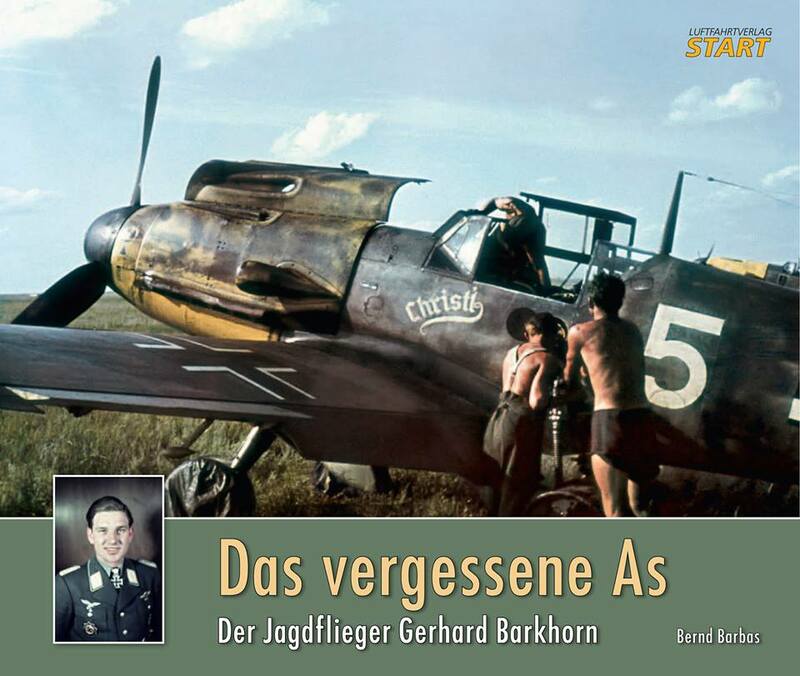 Fifteen aircraft that were flown by Barkhorn are illustrated throughout this book from the first two Bf-109E’s, five Bf-109 F’s, four Bf-109G-6’s, a single Bf-109G-10, A Fw-190D and a jet powered Me-262 are captured here by the artist. No post war aircraft but I suppose this would be a minority interest. The profiles are top draw and accompanied by text to illustrate the finer points of the aircraft. Often there are pictures of that particular kite on the same or adjoining pages. Ahh – that is the other feature I want to mention and not before time either. There are a total of 155 period photos in this book – a total of 35 of these are in colour and some taken by Barkhorn himself – like the several large full page sized magical images of that Barkhorn took himself on a flight over the Caucasus Mountains. As a rule throughout this book the black and white photos are clear and fairly personal. Barkhorn’s chief mechanic is present in many of them and the candid shots of the man himself along with several of the aces of his units include some great shots all. It must have been a major boon for the author and publishers to have secured these pictures for the book and they are a real selling point of the book. Several if not all of his aircraft are featured from the training Heinkel He-51’s through to the many Bf-109’s to the D-9’s and later war and post war jets Barkhorn flew – there are some really good close up and clear views of aircraft I haven’t ever seen the likes of. From the forward and the Luftfahrtverlag-Start Facebook site you will know that Axel and the team worked very hard to restore some of these images for a long time. The work on them is just great and many people would like this book just for the pictures alone. There is one more thing to this book though that I must mention and that of course is the story. The main part and the most interesting of all is the story of this man. No book has captured his full story before – it has always been covered as part of the story of others or as a unit study. The author’s style is direct and workmanlike – he has to tell you the facts as there is a LOT to cover here. Every flight or a summary of the flights on busier days throughout the war is documented in usually what happened and who downed what and who did not return. There are interesting stories about the confusion of the vast frontlines in northern Europe and the English Channel as well as the Russian steppes. The odd thing for me was that his scores amassed so slowly. He still had a great scoring record (you can say the best in ratio to missions flown) but you are almost egging him on as the author explains through his first-hand knowledge and conversations with Barkhorn the scant scoring mission of the early war through to the heady days of multiple victories each mission on the eastern front and the hard times from 1944 onwards. The writing in this book goes from a brief history of his family life then straight into his flight training and military flying life. The areas covered in the book go from Germany in the phoney war through the lightning fast conflict through France. We see Barkhorn as a relative newcomer in this part of the book – struggling not to get shot down (as he did) over the English Channel with JG 2 “Richthofen” and the start of the Russian campaign in the east where we meet many of his fellow aces like Johannes “Mäcky” Steinhoff (a juicy story inside of how he reported on his CO was interesting) as an example to the lowest wingmen who accompanied Barkhorn on his missions. There are plenty of pictures and text detailing the fighting in Russia and this mix gives you a good idea of the fighting in the dust, mud and snow of this massive country. We see Barkhorn with his daughter Ursula and wife Cristl whom he married in 1944 and many of his fellow officers and men in the plains of Russia. We go through the rest of the campaign in Russia detailing his time with JG 52 (and his 300th victory) and then back to command, JG 6 “Horst Wessel” after the ill-fated “operation Bodenplatte took their CO. Though most of his flying was behind the desk as the commanding officer Barkhorn‘s war weary frame saw him in almost retirement at the “Florida House” in Bad Wiesse before he was then again pulled back into the war by General of fighters Adolf Galland and Oberst Steinhoff who had formed an experten squadron of pilots to fight in the Me 262 jet fighters in JV 44. The most interesting and sad part of this story in JV44 was the accident of Oberst Steiner and the failure of Barkhorn to regain his form and strength of mind that saw him as the second highest ace of the war on the German side. Indeed the war ends on a sad note for Barkhorn as he was virtually broken down by fighting at the age of twenty five. This however is not where his story ends. Barkhorn’s career in the post-war Bundeswehr is also examined, Colonel Barkhorn commanded JaBoG 31 “Boelcke,” and flew many types of Jets in the new Luftwaffe from the F-84g, the T-6 and T-33 as well as the Hunter and Kestrel harrier prototype as well as the sleek F-104G. There are several pages explaining his training in Britain and his rise to the ranks through to his bumpy ride to retirement and the later car accident with tragic consequences. Lastly we have some official documents and the listing of his complete victory score sheets. When where and what. It is a big list! Although the book ends abruptly with e end of all things I can say that it was quite a ride. The text, pictures and unique shots from the subject’s own possession add so much authenticity to this tittle. The day-by-day playing out of the war really helps you understand the relentlessness of combat these German pilots must have felt having never really being rotated until they were unfit for flying. The book has such a quality feel that the publishers should take credit for as well – and the accompanying decals that are being sold separately will add your won Barkhorn kit to your modelling bench. You could not be any better prepared to make your own model than you would after reading this history of an interesting figure – well done all who had a hand in this – I can see why it is all-but sold out already in a few of their distributor's shops. Thanks to the team from Luftfahrtverlag-Start for sending this book to us to read - there are still copies left when buying directly from their shop.